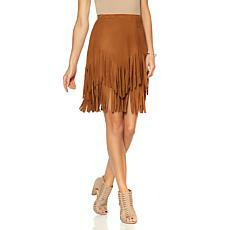 Get out of a fashion rut with fun, flirty Sheryl Crow skirts. Made from quality fabric in go-to colors, these skirts have a rock n' roll vibe that you can wear every day. Chances are, you already have something in your wardrobe that will look great with a skirt from this collection. 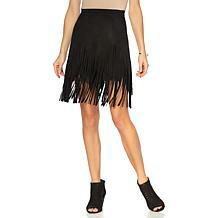 Or, pair a new skirt with a Sheryl Crow top for a full rock star ensemble. Skirts are a closet staple for those who have a hard time finding pants to fit properly. Anyone, however, can benefit from showing off their legs once in a while. 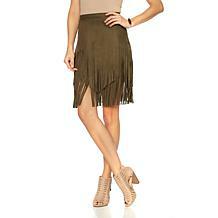 The modest length of these skirts is both stylish and age-appropriate. Designed with one of Sheryl Crow's primary fashion rules in mind, these skirts enable you to feel comfortable as well as fashionable. During chillier weather, pair these skirts with tights and a sharp-looking jacket. An A-line skirt with an edge will spruce up your work wardrobe, give you a reason to go out, or even make a special gift for someone who does not normally splurge on herself. For a beloved wardrobe addition, try Sheryl Crow skirts.